WASHINGTON: Prime Minister Narendra Modi remains “by far” the most popular figure in Indian politics, the Pew said today, releasing the main findings of its latest survey conducted among 2,464 respondents in India. Modi at 88 per cent is 30 points ahead of Congress leader Rahul Gandhi (58%), 31 points ahead of Congress president Sonia Gandhi (57%) and 49 points ahead of Delhi Chief Minister Arvind Kejriwal (39%), said the survey conducted between February 21 and March 10 this year. 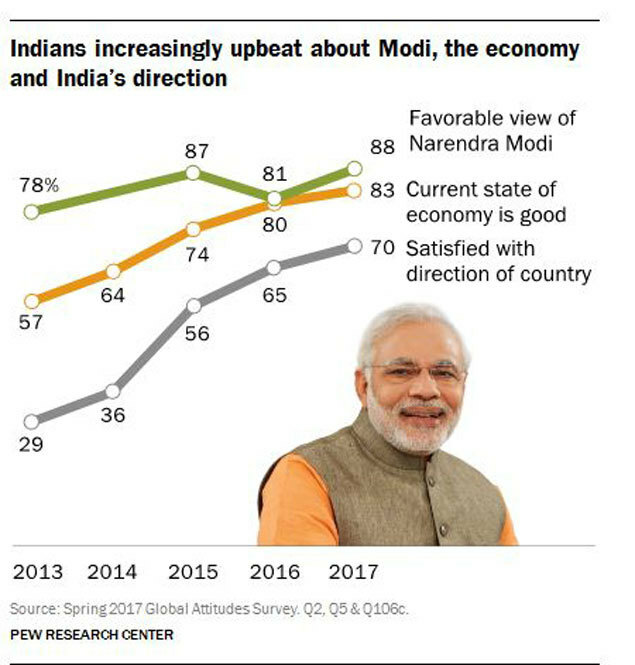 Pew said the public’s “positive assessment” of Modi is buoyed by “growing contentment” with the Indian economy: more than eight-in-ten say economic conditions are “good”, up 19 percentage points since immediately before the 2014 election. The share of adults who say the economy is “very good” (30%) has tripled in the past three years, it added. 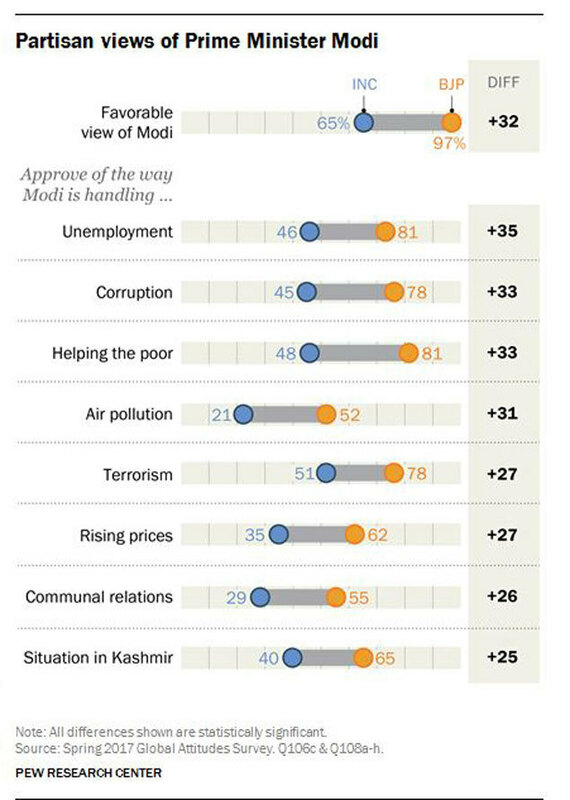 According to Pew, at least nine-in-ten Indians in the southern states of Andhra Pradesh, Karnataka, Tamil Nadu and Telangana and in the western states of Maharashtra, Gujarat and Chhattisgarh hold a favorable view of the prime minister. The same is true for more than eight-in-ten in the eastern states of Bihar, Jharkhand, Odisha and West Bengal and the northern states of Delhi, Haryana, Madhya Pradesh, Punjab, Rajasthan and Uttar Pradesh. Notably, the survey reflects a 21 percentage points drop in favorable view of America among Indians from 70% in 2015 to just 49% in 2017. Same is the case with China, whose favorability rating among Indians have dropped from 41 per cent in 2015 to 26% in 2017. The survey was conducted before the Doklam crisis.